Our replica G-1 aviator bomber jacket is made to the same unyielding standards as the authentic G-1 military version in soft, durable genuine goatskin leather. Removable genuine lamb fur collar with button closure flap. Heavy duty YKK zipper and wind flap with “USN” perforation. Double gussets under each arm. Wool blend knitted cuffs and waistband. Two dual entry pockets. Imprinted WWII U.S. flag lining. 3M Thinsulate insulated filling adds extra warmth for winter. 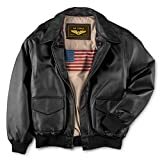 Our replica A-2 aviator bomber jacket is made to the same unyielding standards as the authentic A-2 military version in soft, durable genuine goatskin leather. Snap storm flap over front zipper. Imprinted WWII U.S. flag lining. 3M Thinsulate insulated filling adds extra warmth for winter.